Tesla Motors CEO Elon Musk gave the world a peek into how the company plans to follow its latest electric vehicle, the Model 3 sedan, saying the fourth generation of the vehicle will be affordable to nearly everyone. 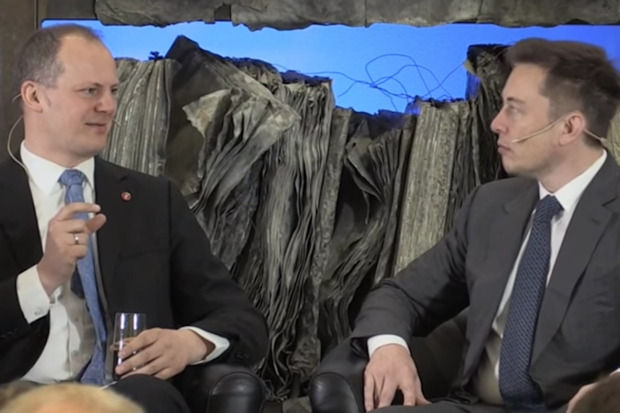 During a question-and-answer period at the Future Transport Solutions conference in Oslo last week, Musk told Norway's Minister of Transport and Communications, Ketil Solvik, that with economies of scale and higher volume production lines, vehicle prices will drop. The Model 3, which won't ship until mid-to-late 2017, has a starting price of around $35,000. That contrasts starkly with other Tesla sedans, such as the Model S, which have a starting price of about $70,000. And, Musk said, it will be one of the safest cars in the world. That's because the Model 3 will include Tesla's Autopilot feature, an advanced driver assistance system. Tesla's Model 3 will have a starting price of $35,000 before federal and state EV tax credits. It is expected out by the end of 2017. With a federal electronic vehicle (EV) tax credit of as much as $7,500, the Model 3's total cost may fall well below $30,000 -- and that doesn't include state tax credits. "I'm super excited about being able to produce a car that most people can afford," Musk said. "And there will be future cars that are even more affordable down the road." "With something like the Model 3, it's designed such that roughly half the people can afford the car," he continued. "With fourth generation and smaller cars and what not, we'll ultimately be in the position where almost everyone will be able to afford the car." While Musk did not offer a time frame for when a follow-on vehicle to the Model 3 would be available, he said the fourth generation (Model 4) vehicle would be even less expensive. When asked by Solvik how long it will be before EVs will be as affordable as internal combustion vehicles, without relying on government subsidies and tax deductions, Musk pointed to subsidies oil and gas industries have enjoyed without the public's knowledge. "The thing that people don't totally appreciate is that every fossil fuel car is quite heavily subsidized," he said. For example, a study by the International Monetary Fund (IMF) found energy subsidies were projected to be $5.3 trillion last year, or 6.5% of global GDP. Additionally, Musk said, the oil and gas industries and the internal combustion car industry takes an enormous toll on the environment, which translates into yet another subsidy for them. "Whenever you have an unpriced externality, where the use of a product causes long-term damage to the environment, that's a true cost. If that cost is not incorporated into the price of petroleum, effectively it's a subsidy," he said. "It's really important to appreciate this because I think a lot of people just don't know the level of subsidies oil and gas get. It's a figure so large that it's difficult to comprehend," Musk added. Musk called for the elimination of those "incentives" for oil and gas companies in order for EVs to "just compete on a level playing field." Tesla is also trying to help other manufacturers as much as possible to develop their own EV technology. For example, he said, Tesla last year released patents for Supercharging station technology to the market. The company also has performed pilot programs with Mercedes and Toyota "to get them educated on electric vehicles. "So we're doing our best to be good sportsmen and to facilitate the advancement of sustainable transport," he said. Key to the adoption of environmentally friendly vehicles will be autonomous driving technology, and Musk said people will trust self-driving cars surprisingly quickly. Not only do self-driving cars use less gas, brake less and produce less wear and tear on mechanical equipment, they also reduce accidents, he said. To date, the feedback that Tesla has received regarding its first version of Autopilot, which Tesla released last year, has been "extremely positive." "When we look at the data ... of cars where Autopilot is turned on or off, the probability of having an accident is 50% lower if you have autopilot on - even with our first version," Musk said. "Even with this early version, it's almost twice as good as with a person," he added.